The BEST Online Guitar Lesson program to date. 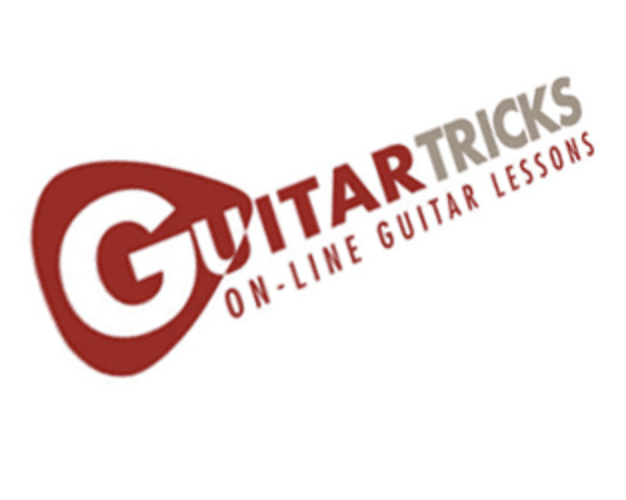 GuitarTricks is the oldest video guitar lessons website that emerged exactly 20 years ago. Back in 1998, GuitarTricks was just another website made by Jon Boderick and it wasn’t so advanced at the time. Nowadays, this is probably the best place to start mastering your guitar skills. With over 11,000 video guitar lessons, you’ll learn to play every music genre, from country and rock to some heavy metal tunes to please your ears. But, is GuitarTricks great for both beginners and advanced guitar players? Well, it certainly is. Aside from the simple beginner lessons, you can find advanced lessons which can help you improve your existing knowledge. One thing that’s great about GuitarTricks is the organization of these lessons. Since we have thousands of them, they are organized by several categories – absolute beginner, beginner, easy, intermediate, advanced, and extreme. We found that many video lessons are in HD quality, which put a smile on my face. Also, the lessons may vary from a few short riffs to more advanced techniques. Aside from the video lessons, we have a possibility to download chord charts and tabs in pdf format, for easy printing. Finally, it’s important to mention that we haven’t found a bad lesson on GuitarTricks. So, let’s continue our GuitarTricks review mentioning some features. With GuitarTricks, you can learn how to play any music genre that involves guitar. For example, you’ll start with Blues and Country and then move to more advanced music genres such as rock and metal. It’s amazing to see that these lessons cover all of this thoroughly. Beware that you’ll need a subscription for all of these features and subscription isn’t expensive at all! For an absolute beginner, there isn’t a better way of learning guitar than the Core Learning System. So, what is this feature? Well, this is a structure of more than 1,500 lessons which will take you on a voyage, starting from the basic stuff and finishing with the more serious lessons. We highly suggest that you start with the Core Learning System as this is one of the best places to get guitar lessons by GuitarTricks. I think we mentioned this one, but why not do it again? Since 1998, GuitarTricks worked hard on bringing us second-to-none guitar lessons, as well as in-depth tips and tricks. 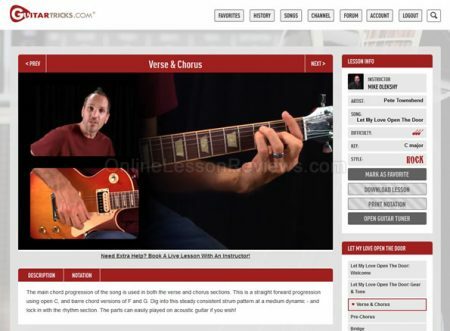 Now, we have over 11,000 lessons that will help you introduce yourself to a guitar and start playing. On top of that, these lessons will help even the most advanced player to become virtuoso at guitar playing. 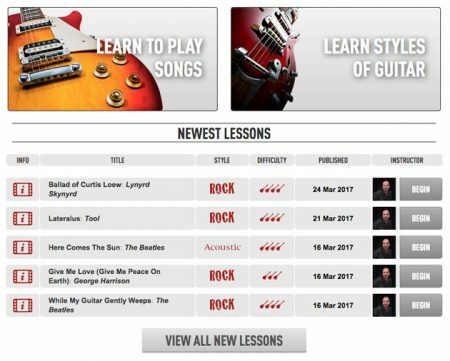 If you subscribe to GuitarTricks, you’ll get an access to all of these lessons, where the free account will let you use only 24 of them. GuitarTricks offers a huge discount now, so you might as well check it out. 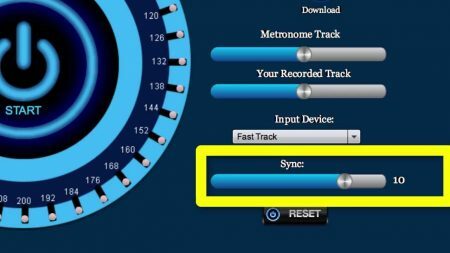 Metronome and Guitar Tuner are maybe the most important features for fine-tuning your guitar. If you’ve ever been to the concert or heard someone playing guitar, you’ve also seen that they spend some time tuning their guitar before the show. Thankfully, GuitarTricks offers these two features which you can access at any time. Tuning your guitar is very important and you’ll need to do it often, depending on the song you want to play. It’s nice that you can just grab your guitar, sit at the front of your PC and do your tuning. Props to GuitarTricks for this one! 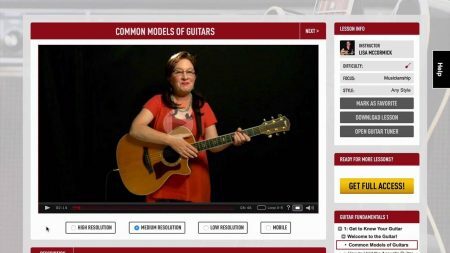 If you have a subscription on GuitarTricks, you can download ANY video lesson to your PC. Isn’t it amazing? You don’t need to be online 24/7 in order to learn how to play the guitar. Next to every lesson, you’ll see a Download button which downloads a video in FLV format and lets you use it immediately. This is great if you’re going on a trip, but want to watch some lessons. Simply download the videos you need, transfer them to your USB drive or smartphone, and you’re ready to go! 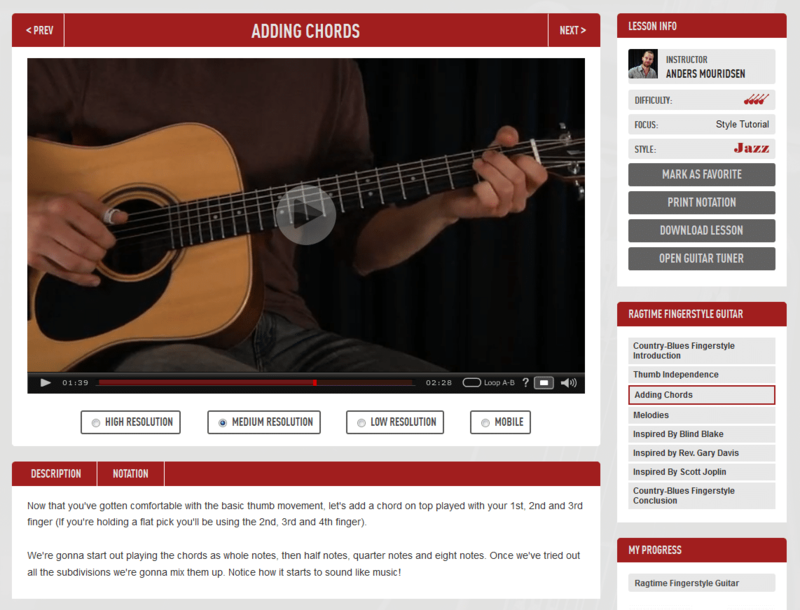 Not only that you can download videos, but also chords and tabs from GuitarTricks. However, I recommend this feature for the users who have a basic knowledge about guitars. The reason for this is that you might not know how to read tabs and chords at the beginning, so relying on the video lessons might be a good choice. Otherwise, it’s great to know that you can have it all at the reach of your hand. GuitarTricks offers a new feature for its users and it’s a 14-day free trial. This feature is relatively new but I’m glad that they introduced it here. This way, you can use two weeks to try some of the features and then get a subscription, either via coupon code or by paying $129 a year. The great thing is that this is a discount price, so you can pay monthly $14.95 instead of $19.95. Don’t miss this change! Tons of video lessons at your disposal. The guitar lessons vary from very easy to very hard. Every video, chord, and tabs are downloadable. New lessons are added weekly, which will grant you a lifetime experience. A 14-day free trial is always a welcome addition. Affordable pricing, especially for the one-year plan. Some of the older videos are produced in lower quality, with the sound and lighting quality being really bad. Bottom Line & What Now? Since you took your time to read our GuitarTricks review up to this point… well, we can only thank you for your attention! 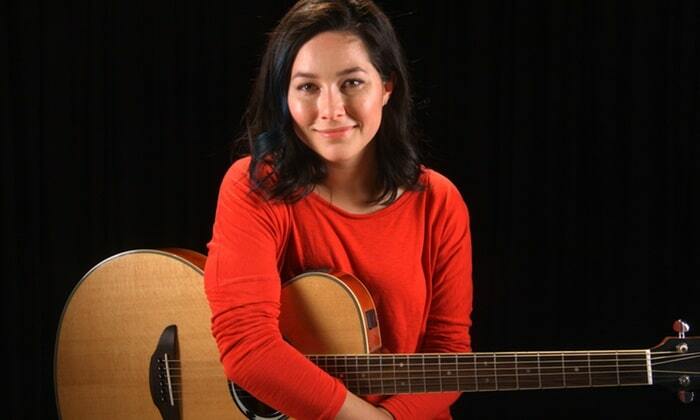 Are you really passionate about playing guitar? Have you ever played guitar? If your answer is positive, you’ll probably learn tons of new stuff from GuitarTricks. GuitarTricks is a website that will help every passionate guitar player at an affordable price. Aside from some older low-quality videos, we simply can’t tell anything negative about GuitarTricks. With tons of videos at your disposal, weekly updates, downloadable lessons, and affordable pricing, I doubt any website could achieve this level of greatness. At the end of the day, GuitarTricks is probably the best way to learn how to play guitar. For just over hundred bucks per year, you can see a huge progress in your guitar knowledge, so you can’t go wrong with GuitarTricks. Get your guitar and start playing some catching riffs because music is a blessing! Disclosure: TopRatedAnything.com is a professional review site, which receives compensation from the companies whose products we review.